This small forest thrush gets its name from the cascade of “veer” notes that make up its ethereal, reedy song—a common sound at dusk and dawn in summer in the damp northern woods. 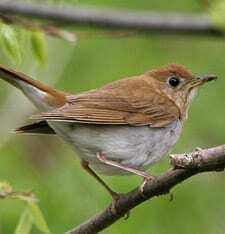 Most Veeries are a warm cinnamon brown above, with delicate spots on the throat; though far northwestern and northeastern populations are darker brown. These birds hop through the forest understory as they forage for insects and fruit. They spend winters in South America.